He responded that a single arrow was enough to destroy all his opponents in the war, and it would then return to his quiver. He further explained that, the first arrow is used to mark all the things that he wants to destroy. On releasing the third arrow, it would destroy all the things that are marked and will then return to his quiver. If he uses the second arrow, then the second arrow will mark all the things that he wants to save. On using the third arrow, it will destroy all the things that are not marked. In other words, with one arrow he can fix all his targets and with the other he can destroy them. Krishna then challenges him to tie all the leaves of the peepal tree under which he was standing, with those arrows. Barbari accepts the challenge and starts meditating to release his arrow by closing his eyes. Then, Krishna without the knowledge of Barbari, plucks one of the leaf of the tree and puts it under his foot. When Barbari releases his first arrow, it marks all the leaves of the tree and finally starts revolving around the leg of Krishna. Then Krishna asks Barbari, as why was the arrow revolving around his foot? For this, Barbarika replies that there must be a leaf under his foot and the arrow was targeting his foot to mark the leaf that is hidden under him. Barbari advises Krishna to lift his leg, since, otherwise the arrow will mark the leaf by pricking Krishna’s leg. Thus, Krishna lifts his foot and to his surprise, finds that the first arrow also marks the leaf that was hidden under his foot. 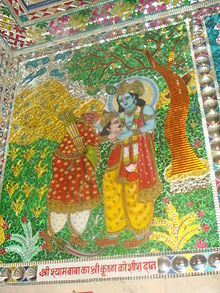 Of course, the third arrow does collect all the leaves (including the one under Krishna’s foot) and ties them together. With this, Krishna concludes that the arrows are so infallible, that even if Barbari is not aware of his targets, the arrows are so powerful that they can still navigate and trace all his intended targets. The moral of this incident is that, in a real battle field, if Krishna wants to isolate someone (for example: the 5 Pandava brothers) and hides them elsewhere in order to avoid them from being Barbarika’s victim, then Krishna will not be successful as the arrows can still trace the target and destroy them. So, nobody will be able to escape from these arrows. Thus Krishna gets a deeper insight about Barbari’s phenomenal power.